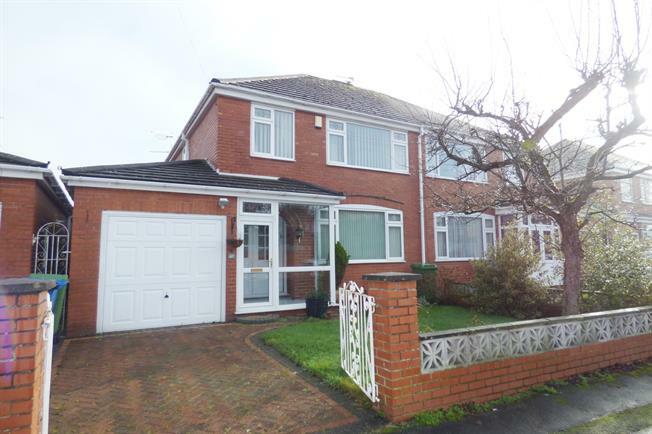 3 Bedroom Semi Detached House For Sale in Warrington for Asking Price £225,000. Boasting the signature build quality expected the property also enjoys three fantastic spacious bedrooms which are all presented to a high standard and with the smallest bedroom having been extended and measuring over 10ft at it maximum. The modern bathroom is separate from the WC but many people have chosen to open this through which creates a wonderful large bathroom ideal for a growing family. The living accommodation is accessed via a large entrance hallway which now benefits from a porch way access ideal for keeping the warm in during the winter months. The large living room is again sized to accommodate the family market and allows access to the separate dining room. One of the additions made to the property is the Edwardian style conservatory which overlooks the rear garden and could be converted to an orangery/garden room if a light-weight tiled roof was to be installed making a more usable room twelve months of the year. The kitchen has also been extended behind the added garage and provides a 19ft open plan breakfast kitchen and allowing access to the rear of the garage. Externally there are well sized lawned gardens to both the front and rear with off-road parking.